I'm only four years old, but I know what I like! until I get Mini Melts Cotton Candy. and you don't need milk with it. That 5 oz. cup was more than enough and it tastes delicious! 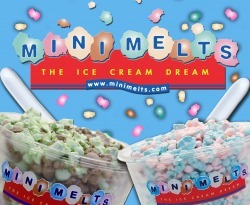 Chocolate Mini Melts is the best. She says it tastes better than chocolate candy. and I don't have to worry if I double dribble. My Dad yelled at me... "Bring me Vanilla!" My brother already had Cookie Dough. I just like them all! Can you really get any flavor? I can't wait to try Moose Tracks.